LIST: Traffic strategy shifts from department stores to gyms and theaters. As big box retailers such as Sears Holding Corp. and Macy’s close stores at malls, Valley shopping center landlords are revamping the va­cant retail spaces as part of an effort to provide new offerings ranging from gyms and movie theaters to outdoor community spaces and cre­ative offices. The goal is to give shoppers additional rea­sons to come and spend time at the mall. “Those traditional department store closings are creating opportunities to re-merchandise centers and add daily needs offerings such as gyms and theaters,” he said. Renovations are currently underway to tum the 160,000-square-foot Sears building into an upscale movie theater complex. In 2015, Centu­ry City-based Westfield also opened the Village at Topanga, an outdoor mall featuring a variety of restaurants and a 24-Hour Fitness aimed at complementing the retail options at the adjacent Westfield Topanga. Many malls in the U.S. are looking for ways to do exactly that. According to a study of 90 regional U.S. shopping centers completed by commercial real estate firm Jones Lang LaSalle Inc., 53 percent of malls surveyed reported renovation budgets totaling over $8.2 billion since 2014. The most common upgrades included adding food and en­tertainment options as well as new outdoor and non-retail community spaces. In addition to recent projects at the Westfield Topanga and the Village malls, Westfield aims to completely redevelop its mostly empty West­field Promenade mall as part of a larger plan to remake the Warner Center. If approved, the$ 1.5 billion development will boast not just 244,000 square feet of retail space, but also 1,400 apart­ments, 629,000 square feet of office space and possibly a 15,000-seat sports facility. Westfield isn’t the only shopping mall own­er looking to attract more than just retail ten­ants. Chicago-based real estate company GGP Inc. has converted 45,000 square feet of empty retail space at its Northridge Fashion Center mall into creative offices. Northridge Fashion Center ranks No. 2 on the Business Journal’s list. chance to take advantage of the area’s tight of­fice inventory. According to data from Colliers International, during the first quarter, office vacancy in the central San Fernando Valley stood at 9.4 percent, compared to an L.A. Coun­ty figure of 15 .6 percent. “The small amount of office space available in our immediate area was what prompted us to take a look at that and see if we could make it work here,” said Daniyel John, general manag­er of the Northridge Fashion Center. In 2011, when the Nordstrom’s at the Glen­dale Galleria, No. 3 on the list, left for a smaller location at the neighboring Americana at Brand, No. 18, the Galleria utilized its vacant retail space to rethink the shopping center’s layout. Gardner said the renovations not only mod­ernized the indoor shopping center’s interior but have made it easier for customers to find the stores that they’re interested in shopping at. “When a consumer or shopper wants to go PacSun, we know through industry knowl­edge and talking with retailers that chances are they’re going to want to shop at Zumiez, Tilly or Aeropostale,” he said. While the indoor Galleria may be sticking with a more traditional retail model than some of its Valley competitors, the mall still aims to diversify its shopping experiences. In addition to updating its food court during the 2012 re­model, the shopping center added a Gold’s Gym in January. 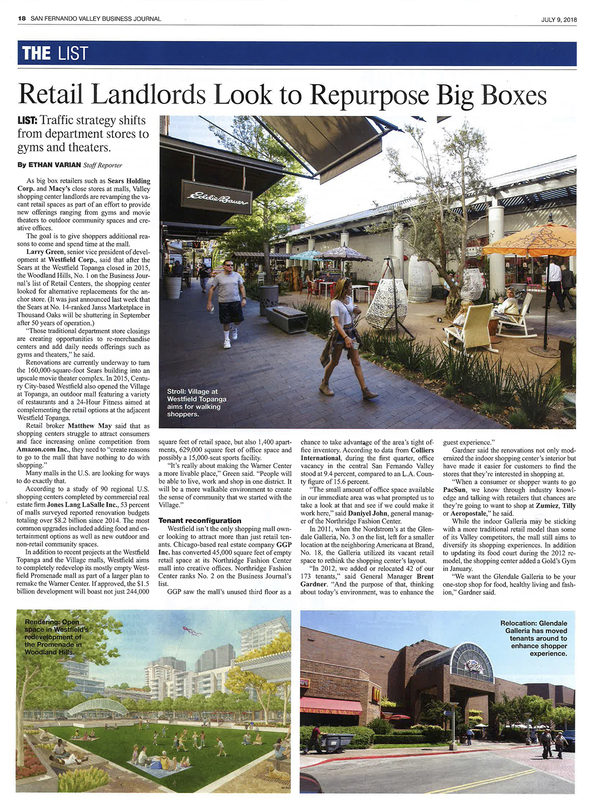 “We want the Glendale Galleria to be your one-stop shop for food, healthy living and fash­ion,” Gardner said.